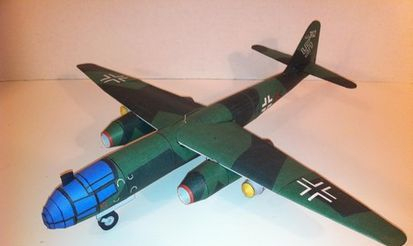 The Arado Ar 234 Blitz (English: lightning) was the world's first operational jet-powered bomber, built by the German Aradocompany in the closing stages of World War II. Produced in very limited numbers, it was used almost entirely in the reconnaissance role, but in its few uses as a bomber it proved to be nearly impossible to intercept. It was the last Luftwaffe aircraft to fly over Britain during the war, in April 1945. 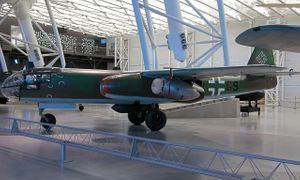 Arado estimated a maximum speed of 780 km/h (480 mph) at 6,000 m (20,000 ft), an operating altitude of 11,000 m (36,000 ft) and a range of 1,995 km (1,240 mi). 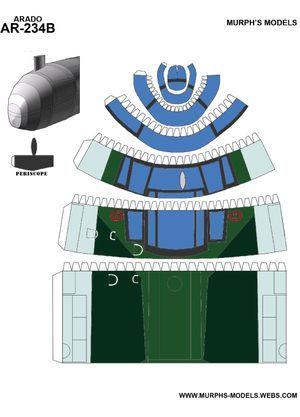 The range was short of the RLM request, but they liked the design and ordered two prototypes as the Ar 234. These were largely complete before the end of 1941, but the Jumo 004 engines were not ready, and would not be ready until February 1943. When they did arrive they were considered unreliable by Junkers for in-flight use and were cleared for static and taxi tests only. Flight-qualified engines were finally delivered, and the Ar 234 V1 made its first flight on 30 July 1943 at Rheine Airfield (presently Rheine-Bentlage Air Base). By September, four prototypes were flying. The second prototype, Arado Ar 234 V2, crashed on 2 October 1943 at Rheine near Münster after suffering a fire in its port wing, failure of both engines and various instrumentation failures. The aircraft dived into the ground from 1,200 m (3,900 ft), killing pilot Flugkapitän Selle. The eight prototype aircraft were fitted with the original arrangement of trolley-and-skid landing gear, intended for the planned operational, but never-produced Ar 234A version.